There arent many groups in North America who could lay claim to possibly 18 different genres of music, but Torontos Enter The Haggis is one of them. To engage this quintet is to indulge rock, fusion, bluegrass, traditional Celtic fare, agitpop, folk, even Latin flavors. Sounds awfully confused, right? Wrong. ETH is one of those rare jewels that actually pulls it all off as if to own everything. Back in the mid-nineties, the band was but a glimmer in the eye of piper Craig Downie. Busking on the streets of Toronto, Downies original intention was to get reacquainted with the bagpipes hed put down while trying to make a go of it as an actor and create a job for himself. At the time, Craig was listening to a few things that had hinted at the fusion of rock and Celtic music. He saw the future. By the end of the decade, the formative Enter The Haggis lineup was in full effect and by the release of Enter The Haggis Live! 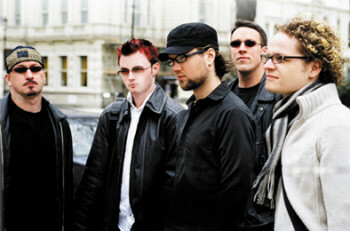 in 2002, the band would become quite a larger animal, amassing fans from coast to coast. The Celtic influence remains palpably intact, which is likely the reason why core fans have stayed so loyal over the past decade. Still, Enter The Haggis continues to break new ground with every offering, and the power of the music is only made more significant by their socio-political conviction. 2004s Casualties Of Retail meshed the aforementioned musical synthesis with lyrics that grab a hold of pertinent issues and cut right to the chase. Standout tracks like Gasoline and Congress shone a light on a well-established social consciousness and channeled it through a sense of musical experimentation arguably unmatched by other groups with their origins. ETHs live show is a musical feast- viscerally dynamic, emotionally uplifting and intellectually stimulating. The bands oeuvre darts effortlessly from the trad strains of, say, The Chieftains and the Pogues to the frenetic pop of early Elvis Costello and even to the Latin-tinged spirit of the Buena Vista Social Club and beyond, complete with Lewingtons deftly guitar playing, the reeling of Brian Buchanans flawless fiddle, the diverse rhythmic machinations of bassist Mark Abraham and drummer James Campbell, and Downies transporting pipes, not to mention the near-perfect vocal harmonies. In fact, if youre game, the groups undeniable power is documented in Live at Lanigans Ball, a film chronicling an Enter The Haggis performance at Plattsburgh, New Yorks Hartman Theatre in December of 2003, originally taped for a PBS special, and now available on DVD. The following year or so has seen further steps up with a stateside release of Casualties Of Retail on new model indie, United For Opportunity and a touring agenda that still has the band doing dates at press time, a TV spot on A&E Breakfast With The Arts back in December 2005, a spot on the popular PBS program Out Of Ireland airing several times between 2005 and 2006 on 260 channels nationwide, accolades in print and a European tour, that kicked off in March 2006 with dates in their ancestral homeland of Scotland, inviting along 30 fans from their native Canada and the United States. All this and its a wonder how the band has been able to write and record new material, but they have! Yes, Enter The Haggis has finished up their fifth LP, a masterwork whose musical scope knows no boundaries, entitled Soapbox Heroes. Recorded in February 2006 at the Clubhouse in Rhinebeck, NY, the album features 10 superb and diverse songs produced by 4-time Grammy winner Neil Dorfsman (Bob Dylan, Paul McCartney, Sting, Dire Straits). Soapbox Heroes, once again, establishes the band as possessing tremendous flexibility while not abandoning their respect for the traditional Celtic genre. The evidence lies in the kickoff piece, Lancaster Gate, an instrumental establishing shot of what you have yet to hear. One Last Drink is a tried and true drinkin tune until you hear the infusion of a horn section that seems to have jumped right off a Calexico record. Cynical is the Waterboys and Midnight Oil colliding with the Pogues, rousing chorus n all, and The Barfly is a piano ballad that the Eagles will simply wish theyd written. To name a few more, No More Stones, embodies Enter The Haggis protest side with its anti-war lyric, Martis Last Stand features Brian, Craig and Trevor on lead vocals and Long Way Home wraps it up as Load Out/Stay wraps up Jackson Brownes Running On Empty. Comments: I realize that one can't base a groups sound by just one song but I can't say I'm really mpressed with "Can't trust the news" So for now I'm taking a wait and see sttitude toward the band and I wish them luck in their new direction. Comments: What? No comments about ETF? I love their music, always a delight to listen to. Yep, they've made their own style, their own genre of music - and they sure love performing! I've never seen them live, the last time they were in California we were gone If you haven't given them a listen, do so today! Write about Enter the Haggis! Want to write a review about Enter the Haggis's music? Or perhaps you would like to share your experience of seeing Enter the Haggis in concert. Feel free to use the following form to post your reviews, comments and thoughts concerning our featured artist! Please login to write your comments about Enter the Haggis.